For members of Kaiser Permanente (KP) in Northern California, Colorado, Hawaii, Mid-Atlantic States (Maryland, Virginia, and Washington, D.C.), Oregon, and SW Washington. 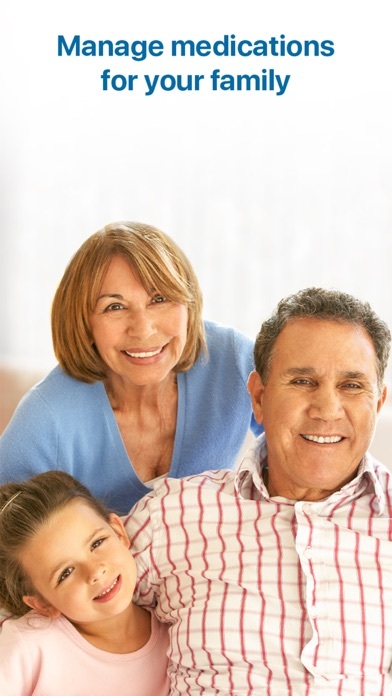 Make it easy and convenient for you and your family to take medications at the right time. My KP Meds automatically imports your list of KP medications and helps you stay on track. Create reminders that work with your schedule. And when it’s time to refill, order from your phone. It’s that simple. 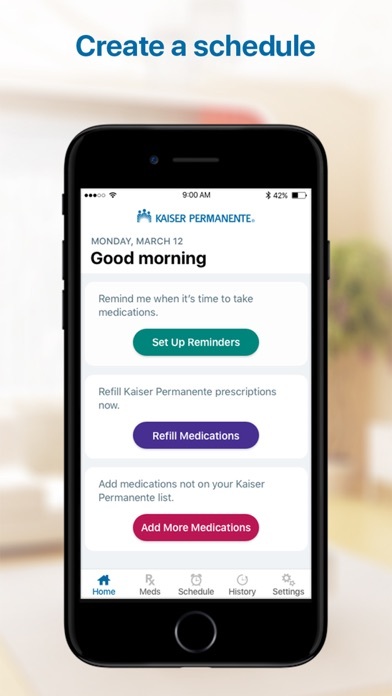 •	View your current KP medications •	Create medication reminders •	Set refill reminders •	Get reminders without signing in •	Order refills •	Track medication history •	View photos of your medications to avoid errors •	Explore features with the in-app guide You can also manage medication lists, schedules, and histories of other KP members you have caregiver access for (proxy). To set up proxy access, visit: • Kp.org/actforfamily Getting started Download and launch the app using your kp.org user ID and password. Haven’t set up your account yet? Get started by tapping “Sign-In Help” at the top of the screen and following the prompts. Every day when I log having taken my medications, that’s all I want to do is update the log. After I do that I have to wait two or three minutes for the next login screen to finish; otherwise I get notifications that I haven’t taken my medications which is not correct. Please let me log when I take medications without bothering me any further. Currently this app is a big waste of time for logging meds. So this app is very useful, there is an issue that renders this app useless, however. This is the scenario; Say I need to take the same medicine 1 time a day now, and for the past 15 years I’ve only taken that medicine when I wake up. And my doctor now added a new medicine I take 3 times a day, with only the morning being the time I take 2 pills together. So I set up a schedule. I schedule my meds for 3 times a day with annoying ringtones to get my attention. If I need to take my meds 3 times a day, and I try to schedule 3 times, the app will delete all previously scheduled times when I try to add a 2nd time for the day to take the medicine. even though it says in the medications tab(2nd from left) under the description of the medicine I need to take it 3 times a day (doctors order for taking the medicine that appears on the medicine label). This makes the app useless. I can take my pill one time a day, no problem but stopping to remember is a habit I need to break. Many people will look for this app as a guide since kaiser does release useful apps. This app will be a 5 out of 5, especially if I can get it to connect to my Alexa! I think people who aren’t tech savvy will end up using and loving this app if you could make it easier to delete an event you set up by clicking on the event, rather than having to delete every single scheduled event by going through your medicine. I was prescribed 2 different antibiotics that were to be taken for 10 days at different intervals. This app reminded me separately on time for each medication. It also allows you to review history. I can’t express my gratitude enough to the developer and Kaiser for this app. Keep up the fantastic work. This patient is right on. App training for KP STAFFF is non existent. I am constantly frustrated by their lack of knowledge re mails, prescriptions etc. Especially for older patients. Please run New stuff by an older patient re ease of use or understanding. I offer my input voluntarily . The Kaiser telephone system and wifi message are garbage. Repeatative irritating and useless.if I get a 972 call it is ignored as You never get to the point re specific call. What a waste of my time and yours. MM Strauss. Typewriter overlays login fields on both iPhone and iPad. For those who manage complicated passwords using a third party password manager the Paste function appears to be disabled in the login Password field. The app repeatedly does not connect to server at login. This is becoming an increasing problem. This is a great reminder I just wish it would give one the option of setting up reminder for every other day as well as daily. VERY USER UNFRIENDLY!!! Impossible to set up correctly for different AM / PM Meds. Not able correct or adjust mistakes APP makes. Don’t waste your time until it is fixed. If you don’t have anger or anxiety issues when you start you will by the time you give up on this APP. When you try to sign in, the keyboard slides up and completely obscures the data entry fields, so it's impossible to sign in and use the app. To make matters worse, they're inexplicably using a custom keyboard. Very poorly written app and zero instructions. Example: It has a setting to take the med daily, weekly or monthly. Not 3 x daily or every 8 hours. So you set the first reminder .. no save button? Oh, it’s the cryptic “s..e” at the top. It becomes Reminder 1. For the second reminder, you add the number of hours, it becomes Reminder 1 and the first one becomes #2. No further reminders are permitted. I’m better off writing the times of my two meds on a bit of paper. Deleted the app. No way to record PRN meds. It seems to require that I check twice in order record having taken the med. Not a bad idea but it could use much more development. I am a post-surgical patient with many new meds and a few old ones to organize. The app preloads all your KP prescriptions and you can key in more ( look for the + at the top of the prescriptions page). 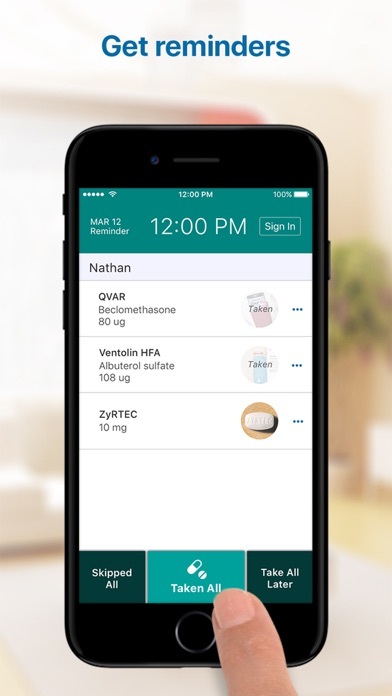 You can make a custom schedule for each drug, you don’t have to use the precoded time increments. The app seems to be unknown to most KP staff so they are offering no training or any real user help (except bugs). They should put out a brochure or build instructions into the app. No delete option, when trying to schedule same meds multiple times a day the results are inconsistent. More alpha testing with multiple scenarios is required. Not even a good beta yet. Works well, even lets you opt to take later or confirm that you did. I hope they will add reminders to refill your medication. So far the app is very helpful. Thank you! This used to be a decent and useful app. But recent updates have made it annoying and frustrating to use. Does not enter times when Meds are taken accurately and always shows them taken at the scheduled time. If taken even a minute early, the app still beeps alerts at the original scheduled time. Completely unable to enter "taken" a day early for meds scheduled on a weekly, bi-weekly or monthly schedule. Version 2 was a decent app. Version 3 is not. After repeated contact, tech support has proven to be unresponsive to these issues. I'm trying to update / make a change something on a schedule and it isn't easy. An updated Use guide would be very helpful. I have been a member for a long time and glad to see the app available. 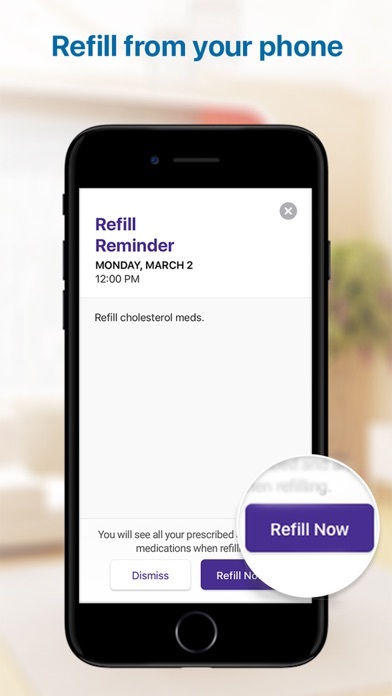 I saw this app promoted in Kaiser as something that would make refilling easier, but when I downloaded it I was saddened to see that this is primarily a medication reminder app. There is a tiny hidden link that takes you into a lackluster refill experience, but that experience should be more prominent and given more love. I LOVED the older version of this KP Meds app. It was so easy to use. I could record exact times meds taken. I could do more with the reminders. It was easy to use & I was so impressed with it, especially compared to other medication reminder apps. Then this last update happened... now it's awful! Please go back. Can I go back to the old version somehow on my phone? Just go back to the old version & add the ability to see my other family members' meds to the older version & then add an option to see what med I am being reminded to take when my phone is still locked. Please! With the new kp app, I can no longer register a "true" time when I take the medication. In the previous version, if I was scheduled to take a medication at 730pm, but actually took it at 8pm, I could record the actual time that she took the medication. It appears that the updated app only allows the user to record an on time or earlier dosage. I prefer the earlier version for recording medication taken as it is more accurate. Stopped being able to order refills on prescriptions. It used to work several upgrades back. Can see and compose emails to doctors. Can track appointments, but emails do that too. Guess they hit supporting this app. This app is great when it works, however it only works about 1/5 of the time. On iOS 10.2 it constantly crashes, and when it does work it will only respond to touch once every 60 seconds, at best. And I have never been able to get The function of re-ordering medications to work; it always times out. After using it for about a week it stopped working. Now all I can get is an error message asking for a valid time. Can't get past that. The app is very helpful to me track my meds. Very unhappy and disappointed about this app, expected KP to have something much better. The app is not reminding me when I switch time zones - which happens a lot to me. It cannot handle half my meds for reminders. I like the concept, but honestly, those of us who need reminder apps the most need more than a few reminders. We need MANY reminders. Triple your reminder ability. No, better, quadruple it. Or 10x as many. Otherwise your app is useless for many of us. Also your app does not show all of my prescriptions claiming I no longer take some of them. Those meds are on my Med list and I do take them. There is clearly a bug somewhere. Been trying to log in for a week. Doesn't work. Says there's an error at this time or something like that. I really need the Kaiser app/website to remind me to refill prescriptions. I downloaded this thinking it would do something useful, such as allow me to use it to automatically refill prescriptions. But instead it just tells you when to take your meds. Perhaps I'm wrong but wouldn't someone helpless enough to need someone to tell them when to take their medication likely also be unable to use something as complex as this phone app? The first thing it did when I opened it was take me to a pop up window in Safari to register with microscopic print, so I was pretty much done there. I just came across this app by chance and I am pretty impressed! 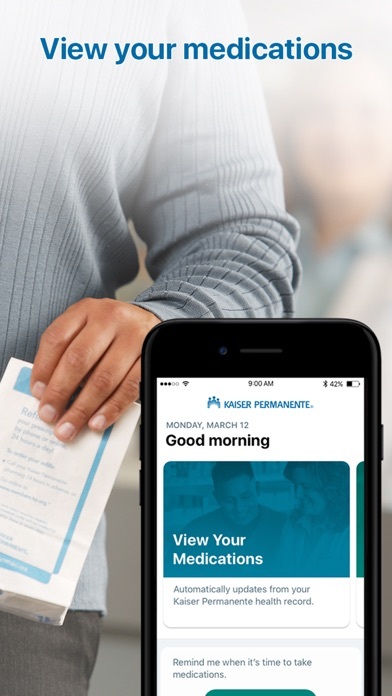 Go Kaiser Permanente! This app allows me to enter my Over-the-Counter Meds, so I have a complete electronic list of all my Meds. I can email or print or pull it up when asked. I love that feature! I can also enter notes or archive Meds I'm no longer taking. Totally awesome! However, I'm giving this 4, not 5 stars, because guess what? ... My doctor will not see anything I've entered!?!?! What? Why not? Too busy? Well maybe a pharmacist, or nurse could review it so my Med List in HealthConnect, the EMR, could be updated and accurate. I've always felt a bit frustrated with the Med List that the physician uses during a clinic visit. It contains drugs that were ordered for 7 or 10 days (like an antibiotic or cold/flu med) that I haven't taken in 2 years! Why are they still showing there? Why not move them to the Historical Meds list? I think it's best practice for that list to show ALL the prescribed and over-the-counter Meds. I take aspirin daily as a prevention measure for stroke or heart attacks. Well I had surgery today and guess what? Aspirin was NOT on the list the hospital staff pulled up! Pretty important information if you're having surgery, right? Fortunately I had shared the info with my surgeon, so all went well. And using the App just now, I entered notes on the pain med my surgeon ordered for me today. It's causing me nervousness, anxiousness and insomnia (it's 4:30 AM right now and I'm still awake!). Is that information going to be part of my medical record? Apparently not because it said my doctor wouldn't see the info I entered. Bottom line? 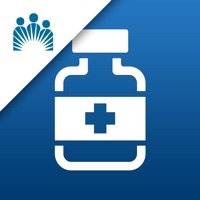 Great app for you to keep track of your Meds. Just don't expect it to be part of you medical record or to interface with the Med list you doctor sees. My advice? Bring it with you to all encounters with your healthcare provider/s and share the info with them in person. Another Kaiser design by an engineer instead of a designer, one that has obviously never had a single user test since it would take no more than one 20-minute test to reveal all its deficiencies. Problems: • You can add notes, but can't see them when reordering. • The notes remain well-hidden at all times, cutting off their use as an easy way to identify what the drug is for, e. g., your blood pressure med, your cholesterol med. This info, of course, should be associated with each drug by Kaiser, but, until Kaiser figures that out, having a short note that appears in lists could really help. • You can "archive" drugs and supplies, but they still show up right in line in the reorder list, helping to ensure you'll buy drugs you're not supposed to be taking. It may be a good idea to show them, as it is not clear how you can un-archive something, but they should appear on a second list that follows the first, with a clear "Archive" label separating the two groups. • They show you brand name equivalents when you're idly reviewing your meds, but not when you're reordering. At that point, you are required to have memorized the long Latin name. Having to switch to Safari to work out which drug is which can make reordering on the device slower than using a laptop or desktop. I love this app!! Love the medication info, the reminders and the ability to refill prescriptions. The only thing I would add is the ability to say I've taken the Meds to the Apple Watch. I get the reminder on the Apple Watch, but have to use the iPhone to say I've taken it. Love the Refill prescription and Taking my meds without having to sign in..
Love that I don't have to sign in when I get a reminder. Nice to be able to refill as well! Nice new look to the app. Love the fact that I don't have to sign in every time to record my meds. Love that refills are available. Easy new user interface. Great app! I'm sure it's some privacy/legal idiocy that makes you sign in every time use it, but unfortunately it makes the app so labor intensive that you won't use it. Maybe the developers will use the apple touch id api to store your encrypted password in the keychain and unlock it with a fingerprint? Can't copy-paste login info, it's always required and can't get past screen one. Would love to use this app, but it does not support pasting in the password field. I use very complex passwords for security and this app will not allow the paste function to work. So it's impossible to log in and use unless I create a very simple password. You have to always sign in. When I wake up at 4:30am to take a pill that is just too much work. It's nice having easy access right to my prescribed meds and fairly nice settings. However, I take pills 7xs a day. I can't be bothered with signing in that many times. Also, no option for if you take 1/2 a pill. They could at least have it so you can mark pills & see history without signing in. Really disappointed. I wanted a pill reminder from Kaiser and thought they would get exactly what we need. Guess not. I have never been able to log in to this app, it always says that it is experiencing difficulties and to try again later. Additionally disallowing the pasting of passwords discourages the use of secure passwords (via password management programs) disallowing the pasting of passwords encourages shorter and easier to remember and type passwords. Having just gone through surgery, And needing to track new meds, I never anticipated finding one from Kaiser! This app,however, needs a better tutorial. If you're tracking pain meds, which are usually prescribed "as needed" with the suggestion of say "every 4 to 6 hours" it takes a few tries to figure out just how to set that up. I really like that when I enter my user ID and password, the database is already populated with my prescribed medications. A good app that is worth exploring further. This app is great for reminding me to take my meds on time. I love how my doctor's prescriptions automatically appear in the app once I log in. Fantastic!